Feta cheese, Greek yogurt, and basil make a tangy cheese sauce that's light but creamy. In this recipe, the feta cheese sauce served over warm pasta. It's also quite good poured over cooked chicken breasts or salmon. Ever versatile, the sauce can also be used as a salad dressing for leafy greens, beans and/or grains. 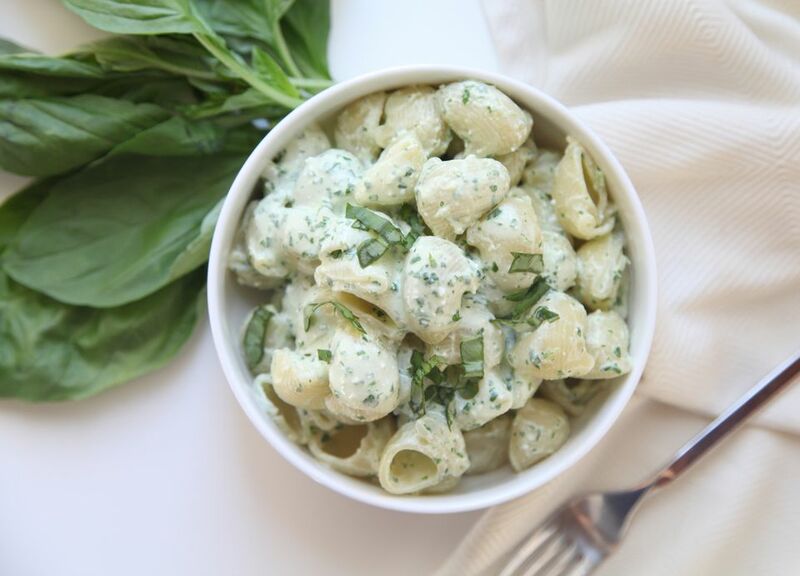 If leftovers are refrigerated, the feta-yogurt sauce will be absorbed completely into the pasta, creating a cold pasta salad with nicely flavored pasta (but no visible sauce). Add chopped vegetables, cold chicken or shrimp to the cold pasta for more flavor. Feta is a great cheese to keep on hand since it stays fresh for weeks and can be added to just about any type of salad, pizza or pasta. It's also delicious drizzled with olive oil and served with bread for a quick appetizer. Feta tends to taste best when it's sold in large chunks, as opposed to pre-crumbled feta. To keep it moist and fresh, pieces of feta should be refrigerated in whey or brine. Most, but not all, feta is sold in whey or brine; either way, you want to have enough to at least partially submerge the cheese. You can make your own brine by mixing water with a little bit of salt. Many stores sell feta from many different countries. Below are some general guidelines, but the only way to know which style of feta you like best - French, Israeli, Bulgarian, Greek, etc... - is to try each one and find a favorite. French Feta: Usually made with excess sheep's' milk that is not used for making Roquefort. French Feta is typically mild and creamy. Some goats' milk Feta is also made in France and can be slightly drier and tangier. Bulgarian Feta: Made from sheep's' milk. Creamier texture, usually less salty. Sometimes it has a little bit of a grassy or "sheepy" flavor mixed in with a yeasty, tangy finish. Greek Feta: Made from at least 70% sheep's' milk, often with a little goats' milk blended in. Salty and tangy, usually rich and creamy, although versions with more goats' milk tend to be drier. Israeli Feta: Full-flavored, creamy, and usually not overly salty feta made from sheep's milk. American Feta: Can be made with sheep, goat or even cows' milk. Often quite tangy and lemony with a texture is less creamy and more crumbly. Finely chop 1 cup of the basil leaves. Set aside. Bring a small pot of water to a boil. Add the remaining 2 cups of the basil leaves and blanch for 20 seconds. Drain, then immediately rinse the basil leaves in cold water or drop into a bowl of ice water. Gently squeeze the basil leaves to remove moisture. Roughly chop the leaves. In a food processor, combine the blanched basil leaves with the garlic and olive oil until very finely chopped. Add the yogurt, feta, and salt. Process until the ingredients come together into a smooth sauce flecked with basil. Add more salt if needed. Top the pasta with the remaining cup of finely chopped basil. Serve immediately while still warm. For a variation of this pasta recipe, add cooked chicken or and either grilled or smoked salmon for more protein.